It’s been part of Detroit’s skyline for decades, but the steeple on the St. Josaphat Catholic Church was badly damaged during a wind storm last fall. The buckled steeple of St. Josephat will soon look the way it did in 1901. View like no other: Fixing steeple at St. Josaphat Church in Detroit. It’s been part of Detroit’s skyline for decades, but the steeple on the St. Josaphat Catholic Church was badly damaged during a wind storm last fall. Shingles were torn off and holes were left behind. Church members raised tens of thousands of dollars to repair it and now the work is in the final stages. The buckled steeple of St. Josephat will soon look the way it did in 1901. Crews from Detroit Cornice and Slate are working nearly 200 feet above Canfield Street. Last November, parishioners feared the steeple would have to be torn down if it didn’t blow down. “We came up and installed these brackets on the hips and installed three-eighth cable and turnbuckles,” one of the workers said. And straightened it out, very carefully. “That’s why we took a week to move it, a little at a time. Give it time to relax then tighten the turnbuckles more,” the worker said. They put in several wood floors for stability. They’ve put on new weatherproof sheeting and new slate shingles. They worked on a platform that moves vertically. Local 4’s Roger Weber asked Council President Dennis Piotrowski how they’re paying for all this. Insurance is one part. The steeple sign is another. About $90,000 had poured in. They need more money but they said the job will be done. I am feeling very blessed today that the church my ancestors built, attended, and loved is being saved for the next generation. I know I am luckier than most whose ancestors built these magnificent churches in Detroit. Every day I run across fans of The Sugar House who tell me their family church has been torn down or closed. I hope with the rebuilding of St. Josaphat’s steeples this will now become the new trend in the city of Detroit. A city that will truly be true to the motto it has held for over 200 years. Translation: “We Hope For Better Things; It Shall Rise From the Ashes”. 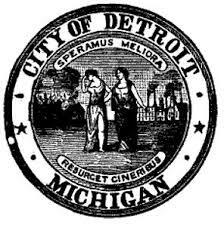 This entry was posted in Detroit History and tagged Catholic, detroit, history, Immigrants, Michigan History, Polish, The Sugar House. Bookmark the permalink.